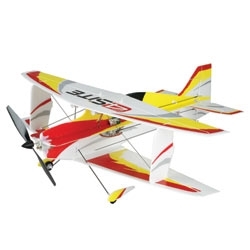 The 4-Site™ Bind-N-Fly® Ultra Micro Flyer from E-flite is designed to give experienced 3D pilots, who already have a Spektrum™ or JR® 2.4GHz DSM2™ system, a thoroughly-capable 3D machine that can be flown at the local gym. The “secret” behind the Ultra-Micro 4-Site’s awesome 3D-capabilities is a unique manufacturing technique that results in foam wing, fuselage and tail parts that are actually lighter, stiffer and more durable than standard sheet foam. It also gives the wing an airfoil shape that provides superior flight performance to standard sheet foam.These parts are further reinforced with carbon rod and foam bracing that minimizes in-flight flexing and twisting. This exceptionally robust construction, combined with the performance of independent aileron servos, gives the 4-Site a level of control and responsiveness any 3D foamie expert will love. The 4-Site BNF comes completely assembled with a Spektrum AR6400L Ultra Micro DSM2 Receiver/ESC/Servo unit that features two built-in linear long-throw servos for the elevator and rudder. This along with the two independent long-throw Spektrum AS2000L Ultra Micro servos on the ailerons provide great performance. Also included are two 1S 3.7V 150mAh Li-Po battery packs as well as E-flite’s Celectra 4-Port Li-Po charger and AC adapter that allows you to charge up to four 1S Li-Po packs at once. In the event of a crash you can repair the 4-Site using foam-safe CA and or clear tape. Be very careful not to use too much glue and or tape. The airframe weight is critical to the flight performance and will be affected by adding weight.